When life is crazy…sometimes the only sane thing to do is eat chocolate. And when hurricanes battle down an entire side of the country, when earthquakes have taken the ground from underneath us, and when there is no way to right the wrongs across the globe that mount in my head, sometimes I just need a diversion. Specifically, a devil’s food cupcake diversion which has been topped with whipped peanut butter frosting and then dipped in melted bittersweet chocolate. Because biting into it makes the perfect chocolatey crunch and numbs my mind, blurs the negative and for a few brief seconds creates cupcake euphoria. Because it’s impossible to think of anything bad when eating something this good. I have only started this blog a little over a year ago and as I peruse my posts today, I note the several times where I link to the Red Cross, to ask my readers to donate because of a recent disaster. From tornadoes to tsunamis, to earthquakes that take down entire cities and to these latest hurricanes this weekend— this year has been an unearthly mess. So today, when I can’t seem to make sense of the big things, I have decided to focus only on chocolate and that I can handle. Taken from A Farm Girl’s Dabbles. Please click on the link for the recipe. 2 c. of good quality chocolate chips or chopped bittersweet chocolate. 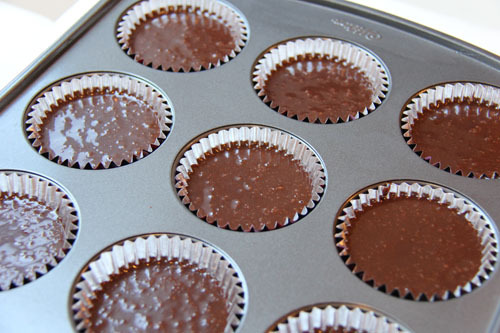 Cake: Prepare pan by placing cupcake liners in muffin pan. Preheat the oven to 325 degrees Fahrenheit. 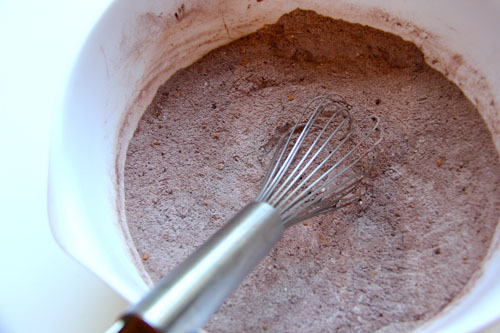 With mixer on LOW speed, add one third of the sifted dry ingredients to oil mixture and beat until blended. Then add one third of the hot water and slowly combine these (you don’t want the hot water to splatter on you…ouch!). Continue this process, scraping down the bowl often until all ingredients have been add and mixed. Scoop batter into liners and fill only 2/3 full. 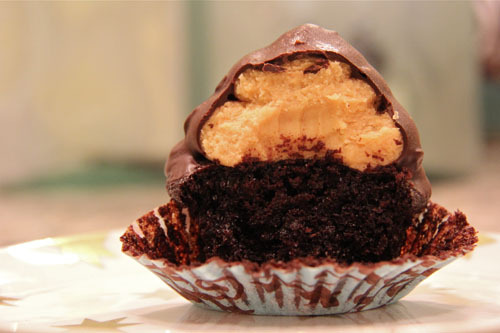 To frost: Use a large circle tip with a big opening to pipe the peanut butter frosting in the shape of a chocolate kiss on top of each cupcake. Freeze the frosted cupcakes for an hour. After the hour, take the cupcakes out of the freezer and melt your chocolate. Melt your chocolate chips in a microwave safe bowl for one minute and then stir. Then microwave for one minute more. It should be just barely melted and once you stir it up it should be smooth. If it’s not, then heat it up for another 20 seconds or so. You don’t want to melt your chocolate too long because it will end up getting lumpy. 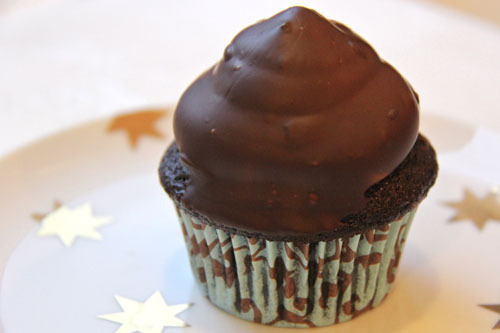 Dip each cupcake upside down into the chocolate, holding onto the wrapper portion. Twist the cupcake gently in the melted chocolate and stand back up on a plate. Refrigerate your cupcakes for at least an hour before serving. Store cupcakes in the refrigerator since they are coated in chocolate. Categories: Chocolate, Cupcakes | Tags: buckeye cupcakes, chocolate dipped peanut butter cupcakes, Cups Peanut butter dipped chocolate dipped, devil's food cupcakes, peanut butter frosting | Permalink. Very warm post Geni, I really enjoyed reading..but so wished that all those unearthly events didn’t happen, and still indulge the chocolate’s sensation with happiness and celebration! Your sweet treats look incredible, but there is no surprise since you are a master for chocolate! Love the idea of PB filling.. Beautifully written Geni! Such a pity that man has caused earth to react so savagely! A heavenly treat to brighten the times! You and I see eye-to-eye on oh so many things. I wish I had had these around while I was waiting and waiting and waiting (I’m still waiting) for the hurricane to hit! Lovely post! And the cupcakes look delicious. Best quote ever! And those cupcakes look divine – a great way to focus on the little instead of the big. Hope your week turns out a little less crazy, Geni! Oh my gosh Geni, these look amazing! They look like a perfect diversion. You’re right Geni, the world would be a sweeter place if we all could have a bite of these cupcakes! And talk about a bite.. wow, open wide because this is a towering cupcake of yumminess!! You’ve done it again! Oh my goodness, now I have a new way to eat that fabulous frosting – my family is going to LOVE this! Thanks for the link! Oh my heavens, you just made my mouth water with those cupcakes. They look fantastic! Cupcake Euphoria sounds like the perfect way to bring sense to the craziness surrounding us. Hopefully it was at least a few moments of delicious peace! I can relate to the title of your post. Sometimes when things are just way too much I pull out my fav choc chip cookie recipe and know that at least that is always the same. And is it just me, or are there are a heap more natural disasters in the past few years then ever before? P.S. The middle pic, where you can see the inside of cup cake and the layers, makes me want to lick my screen. My mouth is watering after reviewing your pictures and recipe. This is insanely brilliant. Chocolatey, peanut buttery greatness! Chocolate makes everything just a little bit better doesnt it? These cupcakes look amazing. Especially with that peanut butter frosting. I am, I confess, literally drooling. I hope my husband doesn’t see. Yes, Geni, chocolate does have a way of soothing the soul. Those cupcakes look incredible – I love the surprise inside! This year has been full of disasters and sadness, global and personal. Things somehow don’t seem to make much sense sometimes and chocolate euphoria is the way to beat it. May we have peace n prosperity in this world as it is the future we are making for the generation to come. Alright, blog-twin, what are you going to post next? 😉 I’m not sure what my next post will be, so maybe you can give me some insight? These look fabulous, and a perfect way to drown your sorrows. It sure has been a heck of a year. Geni, I swear to goodness that we’re cooking soul mates. The night before you posted this, I had such an intense chocolate-peanut butter craving that I hopped online and chose a recipe I’m planning on making later this week. Same. Page. This week in the world really does call for some peanut buttery, chocolatey comfort. And these look gorgeous. I love this idea. Genius! This recipe makes about 18 cupcakes. You may want to make 1.5 times the frosting since I came up a little short. I definitely was generous with the amount of frosting per cupcake as you can see in the photo though so if you use less frosting, then maybe you can get by with one recipe. Oh what a delight! And a winning desire for a chocolholic! I’ve never made peanut butter frosting, but a good excuse to make some chocolate cupcakes this week. They are a lot of fun for the kids and I’ve been making them lately continously for my neice and nephew.A great recipe! I’m not a peanut butter lover but I could never say no to a good chocolate cupcake! Oh my, I think I could happily eat this every day for the rest of my life and die a happy girl! (Calories aside, of course. 😉 ) Seriously, they look amazing. And thanks for the link to the Red Cross, there are so many out there who could use help. A happy and delicious calorie bomb! I love it! Oh. my. gosh. These cupcakes rock…seriously.